Biting opponents may be appalling but it is harmless and should not be punished as severely as a bad tackle, says controversial Barcelona striker Luis Suarez. The Uruguayan marksmen is set to make his long-awaited Barca debut in El Clasico at Real Madrid later on Saturday after completing a four-month ban for sinking his teeth into Italy defender Georgi Chiellini at the World Cup finals in Brazil. It was the third time that Suarez bit an opponent, with previous incidents at former clubs Ajax in 2010 and Liverpool in 2013 punished with seven and 10-match bans respectively. The 27-year-old said he was getting help to control his "impulse" to bite but in his new book Crossing The Line: My Story, serialised in The Guardian newspaper on Saturday, he said that the offence should not receive severe punishment. "After my 10-match ban in 2013 for biting (Chelsea defender) Branislav Ivanovic (for Liverpool), I had questioned the double standards and how the fact that no one actually gets hurt is never taken into consideration," Suarez wrote. "The damage to the player is incomparable with that suffered by a horrendous challenge. Sometimes English football takes pride in having the lowest yellow-card count in Europe, but of course it will have if you can take someone's leg off and still not be booked. "When they can say it is the league with the fewest career-threatening tackles, then it will be something to be proud of. "I know biting appalls a lot of people, but it's relatively harmless. Or at least it was in the incidents I was involved in. When Ivanovic rolled up his sleeve to show the referee the mark at Anfield, there was virtually nothing there," he added. "None of the bites has been like Mike Tyson on Evander Holyfield's ear. But none of this makes it right." Suarez, who top-scored in the Premier League with a remarkable 31 goals in 33 games for Liverpool last season, moved to the Nou Camp in an 81 million euros ($102.63 million) deal after his World Cup controversy. 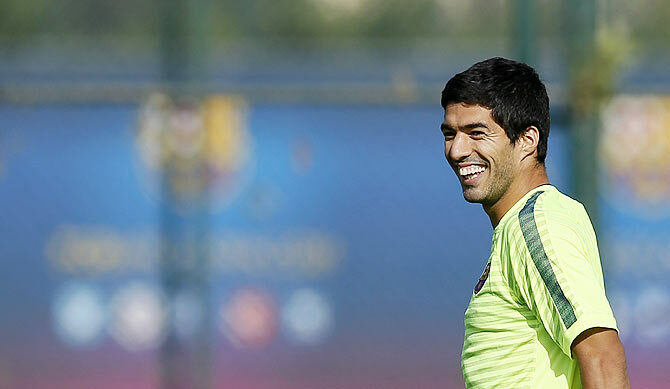 Barca coach Luis Enrique said the Uruguayan will play some part in the huge match in the Bernabeu on Saturday. It will be a high-octane, tumultuous atmosphere for Suarez to make his comeback to competitive action for the first time since June. He admitted that previously the adrenaline levels and pressure in high-profile matches have caused his biting impulse to manifest itself but said there will be no repeat now that he was getting the right help. "Everyone has different ways of defending themselves. In my case, the pressure and tension came out in that way," Suarez told the Guardian Weekend magazine in an interview on Saturday. "There are other players who react by breaking someone's leg, or smashing someone's nose across their face. What happened with Chiellini is seen as worse. "It is like an impulse, like a reaction. I believe I am on the right path now, dealing with the people who can help me, the right kind of people."